If you die you will lose your items. You can leave the minigame at anytime to bank and resupply if you are running low on food. All damage done to the current monster will be reset but you will not have to defeat all previous monsters. Ring of recoil is highly recommended due to it being able to weaken the mother regardless of what colour the mother is. You can use any basic gear, these specific items are not required. However, it is recommended that you bring all methods of combat to kill the Gelatinnoth Mother, including the 4 element spells. It is possible just to wait to kill it with range but this is quite difficult with no prayer and limited amounts of food. You will face 7 monsters, and will not be allowed to use prayers. All the monsters (excluding 6) are easy and the simple method is just to shoot them with the rune crossbow and bolts. The Gelatinnoth Mother however, requires all styles of combat to defeat. It has six variations where only one style of combat can damage the monster. The mother changes between 6 colours where she has a weakness to melee, ranged or a certain magic spell. The colour of the monster indicates what its weakness is, and all other damage is negated. The varying colours are shown below, along with its weakness allowing you to deal damage to the mother. 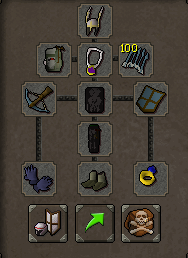 Upon completion of the minigame, if you click collect on the chest in Lumridge basement, you can buy barrows gloves for 300k! 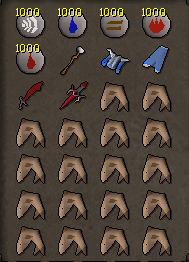 Other methods of obtaining barrows gloves are purchasing them for 25 pk points or 35 vote points. Regardless, the cheapest and quickest way is completing the recipe for disaster minigame allowing you to spend your Vote or PK points on other items available in the shops! If there are any issues with this guide, please reply to the post, and edits will be made where necessary. So many people don't know how to do RFD or realize how easy it is and spend points on Barrows gloves. Hopefully this helps those players & new players! Great guide thanks for posting!